Purchasing a rain barrel from ABC Seamless of Albuquerque for your home in Rio Rancho, New Mexico, or another surrounding area gives you the ability to keep your lawn and foliage watered and healthy even throughout drought conditions. Our rain barrels will collect water from your gutters during the occasional rain storm so that you can save it for when water is once again a precious commodity. 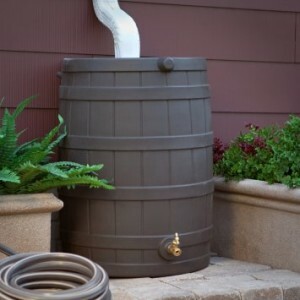 Additionally, our rain barrels can help prevent landscape erosion caused by water draining out of your gutter system and straight into the ground. What’s more, a rain barrel is a terrific tool for anyone who is environmentally conscious. Rather than using municipal water sources, the rain barrels we offer allow homeowners to capture and repurpose rainfall, saving valuable resources that are increasingly scarce throughout the Southwest. Additionally, to get the most out of your new rain barrel it is important to have an efficient gutter system installed on your home. Fortunately, ABC Seamless of Albuquerque also specializes in installing rain gutters that provide the best protection against the rare moments of heavy rainfall in the area. Our gutters are entirely seamless, meaning they will not be susceptible to the cracks or leaks commonly found in traditional pre-cut gutters. Furthermore, our gutters are approximately 30 percent wider than traditional gutter systems, allowing for a better flow of rain throughout your entire gutter system. Together, these benefits of our seamless gutters will make your barrel much more effective at capturing the most rainfall possible. To learn more about rain barrel options and seamless gutters for your home in Rio Rancho, NM, or another surrounding area, contact ABC Seamless of Albuquerque today.